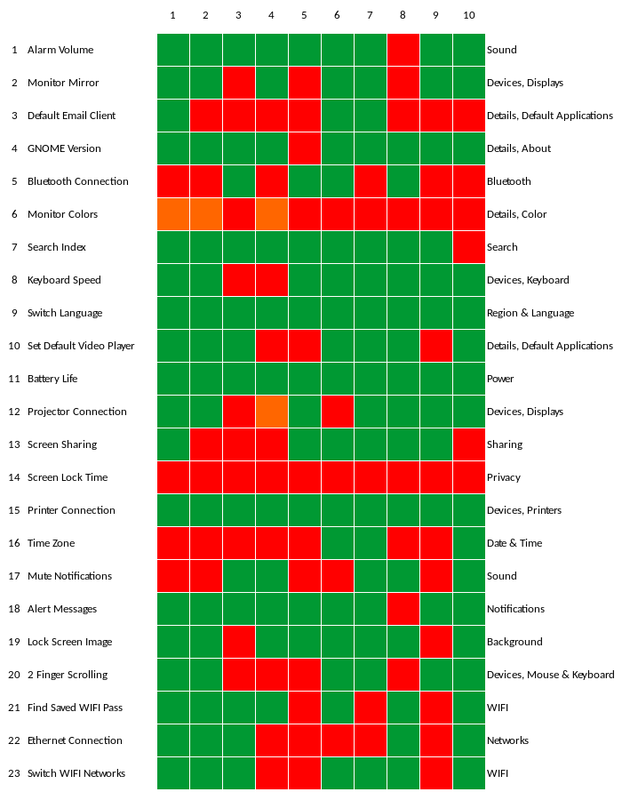 Renata has posted an analysis of her GNOME usability test. 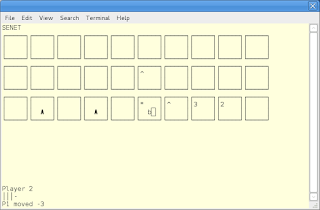 You may recall this was a traditional usability test of other areas of GNOME development. We also wanted to measure how GNOME has improved since our last usability test (which was examined in a previous cycle of Outreachy). Read Renata's blog posts for details, but I'll share very brief overview here. I find it's best to do the analysis in two parts: a heat map, and a discussion of themes. The heat map shows several "hot" rows: creating an album in Photos, adding a new calendar in Calendar, and adding an online account in Calendar. 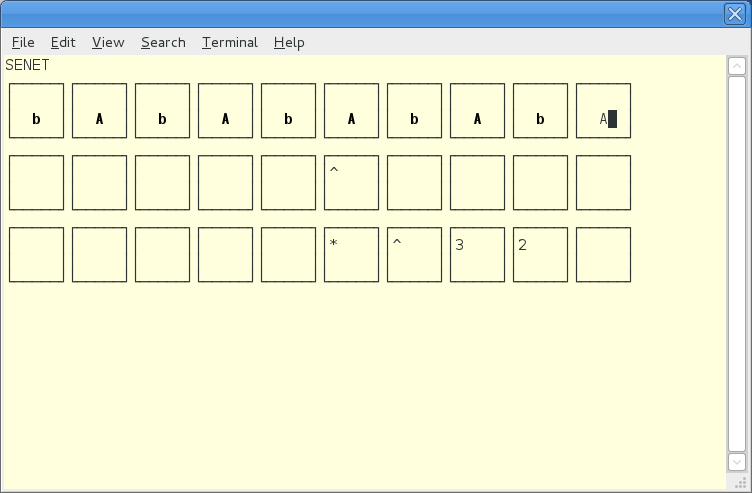 You can also see other "warm" rows as well, but I'll leave those for you to read in Renata's blog. Renata observed: "This task was definitely the most challenging to accomplish. All participants went through similar steps to complete this one. First they clicked “Albums” on the view switcher and then tried clicking “Name your first album”, thinking that this option would create a new album. That didn’t work, so they tried right clicking on the screen which also didn’t work. After that, they looked for a “Create an Album” option in the “Application menu” and could not find it. Some participants even searched for “Create an Album” in the search bar. Finally, they tried right clicking on “Photos” and found the “Add to Album” option on the bottom of the screen." From Renata's blog: "In general, all participants were confused by the term “Add a new Calendar” or “Create a new Calendar”. They would expect for an option like “Add a new Calendar” to be located somewhere in the application menu or in a “more obvious” location and not under the “Calendar Settings”. Some even created a new event instead of adding new calendar. Almost all testers were not sure which option to choose for adding the calendar. Testers expected feedback after they named the calendar. They complained about not having an “Apply” button since they were not quite sure if they added the new album." Renata says this: "The first thing some testers did to is choosing the “synchronize” option on header bar menu. The “+” and “-” signs [in the Online Accounts menu] were not that obvious to indicate their meanings. They would rather prefer something like “Add an Account” and “Remove an Account” buttons." The folks over at Mozilla (makers of Firefox) are redesigning their logo—because apparently just having a wordmark isn't good enough. That said, maybe it's time to retire the dinosaur head. In the spirit of openness, Mozilla has posted a series of logo concepts to their blog and invited the public to review and share their opinions. I am doing so here. But the truth is that not every organization needs a logo. And in Mozilla's case, my opinion is that maybe they don't need to update their logo. 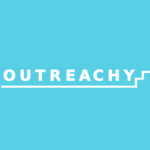 Working at the grassroots and policy levels, we teach web literacy, provide tools and advocate on behalf of every individual who values an internet built on fairness, inclusion and respect. Using the web as the platform, we build open, innovative technologies that allow developers to work free of closed, corporate ecosystems and create faster, safer web experiences for us all. That's a lot to encapsulate in a logo, if Mozilla wants to embody these principles in their new logo. But they gave it a good try. 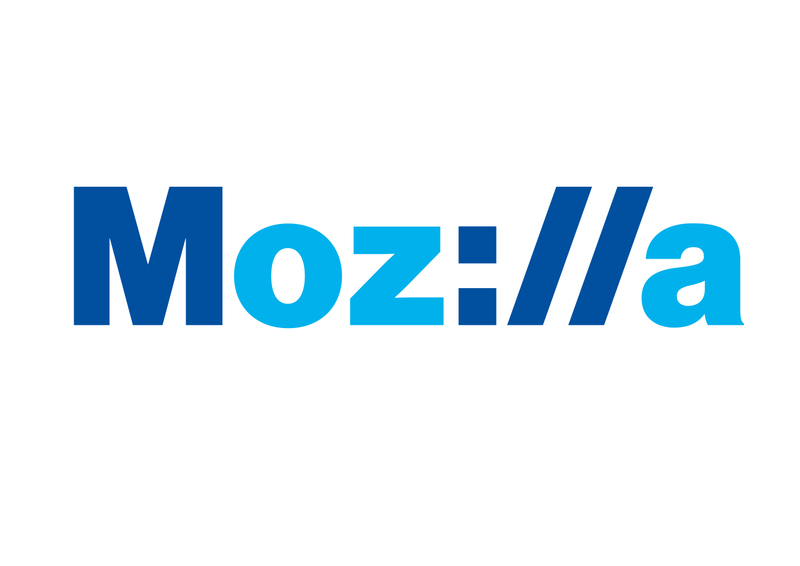 That's a simple logo that represents both the "Mozilla" wordmark and reminds users that they are about the Internet. If you want to reassure others in a meeting, wear a blue tie. From the article: "Blue ties are a good investment because the colour reminds people of the sky and ocean, which has a calming effect, said Lindsay. … Patterned blue ties tend to give off a classic professional feel and can be worn in a global business environment without sending the wrong message. A subtle blue can be “soft and introspective” while a cobalt or royal blue can help you stand out just the right amount, she said. “Dark blues are often reminiscent of well-respected pilot uniforms. Navy blue is a trusted colour and gives us confidence." So that's my recommendation to Mozilla: if you're really going to update the logo, this one seems best to me. But whatever logo you choose, I encourage you to use pleasant shades of blue. Ciarrai isn't on Planet GNOME, so I wanted to highlight their recent post about the Paper Prototype Test Analysis. This usability test was a paper prototype usability test of the updated GNOME Settings application. Ciarrai included ten testers between twenty and forty years old, with good gender distribution (male, female, nonbinary) and pretty equal preferred OS platform (Mac, Windows, Linux) with slightly more non-technology professionals than technology professionals. Every participant claimed to use the internet daily. Only three of the participants had ever seen GNOME before. 1. You set an alarm on your laptop. Now you want to make sure that it will be loud enough to hear from across the room. Where would you look in the settings app to change the volume of the alarm? 2. 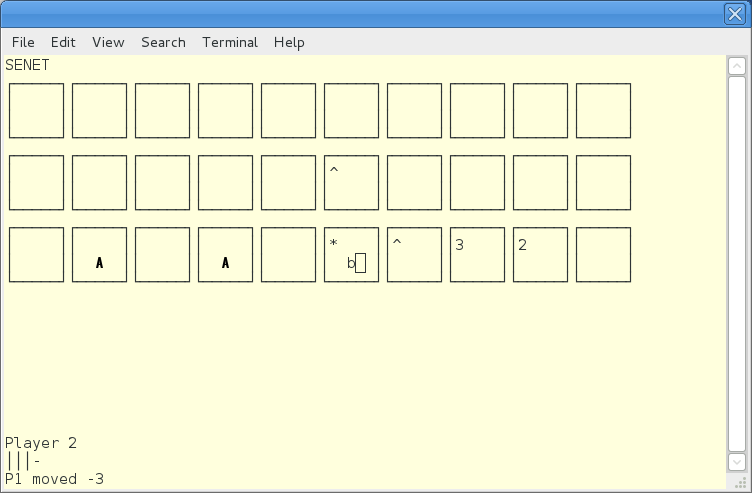 You want to simultaneously be to able to view your web browser and a text editor where you are working on a document. You have two monitors and want to spread your work space across them. Which setting would you use to enable this function? 3. You want to have your Thunderbird account to be the email that opens whenever GNOME is asked to open an e-mail client. Which setting would you try to make Thunderbird your official email? 4. You would like to know which version of GNOME you are running so that you can see if you are up to date. Which setting would you try to find out this information? 5. You are about to watch a movie on your computer. The internal sound is too low so you get out a Bluetooth speaker. Where in the settings app would you go to connect the speaker to your computer? 6. You are working on a few design projects and want to adjust the way your monitor handles colors so that none of the image quality is lost. Which setting would you try first to change the default colors? 7. You would like to be able to access photos from GNOME shell search. Which setting would you try first to see if photos can be indexed in a search? 8. You are a very skilled typist. You notice that a lag on your keyboard and want to speed up the computers’ response to your key strokes. Where would you look in the settings app for a way to change the keyboard speed? 9. You are going out of town for a week and having a friend housesit for you. She wants to use your desktop computer while you are gone and you are happy to oblige. Your friend’s native language is Spanish while yours is English. You think it would be nice to set your computer to Spanish for her so that she can use it more efficiently. Where would you look to switch the language to Spanish? 10. You prefer watching movies with the video player VLC. You would like to set VLC as the video player that GNOME connects to automatically. Which setting would you try first to make the change? 11. In a few minutes you are expected to be in a two hour long lecture. You want to take notes on your laptop during the talk. Where in settings would you look to see how much battery charge you have left in order to know whether you have to run to your car and get the charger before the lecture starts? 12. You’re at the office and you want to show a work presentation with a projector. Which Setting would you try first to connect your laptop to the projector? 13. You’re preparing for a remote work meeting. You wish to set a password that you will give to your coworkers so they can see and control your screen during the meeting. With which setting would you first attempt to do this task? 14. You find that you don’t like only having 5 minutes of idleness before your screen locks on your system. Where in the settings would you go first to adjust the wait time from 5 to 10 minutes. 15. You just bought a new printer. Which setting would you choose first to connect the new printer to your computer over WiFi? 16. You are living abroad for several months in a country with a time zone 6 hours ahead of yours. Where in setting would you go to adjust the time zone to reflect your new location? 17. You are listening to music on your computer. At the same time, you are torrenting a number of files. You don’t want the notification sound to disrupt your music each time a file successfully downloads. Which setting would you try first to mute the volume of the notification? 18. You don’t want to have alert messages come up when your screen is locked. Which setting would you try first to turn off these messages? 19. You are tired of looking at the default lock screen image on your computer. Where would you look first in the settings application in order to replace the lock screen image with a picture of your family that you have saved on your computer? 20. You want to be able to scroll with two fingers on your touchpad. Which setting would you try first to enable this scrolling on your touchpad? 21. You have the WiFi password for your favorite local coffee shop saved on your computer. While you are there one day working on your laptop the person next to you asks if you know the WiFi password. Where in settings would you look to locate the saved password in order to share it? 22. You’re at the office trying to get work done. The WiFi has gone down three times already today and you are frustrated with waiting. You have an Ethernet cable plugged in and set up already, which panel would you try first in the Network settings to switch over from WiFi to Ethernet? 23. You’re not getting a great signal to the internet. Where in the Network settings app would you go to change which WiFi network you are connected to? The last three questions focused on the WiFi panel. If you are interested in usability testing, these posts are a great starting point. Next up: analysis! Looking forward to LAS GNOME! I'm on the schedule for LAS GNOME this September, to share our usability test results. Diana, Ciarrai and Renata have been working hard this summer in GNOME Outreachy, doing different usability tests. Our tests include a paper prototype test of the new Settings app, a traditional usability test of other areas of GNOME development, and a first experience test where people use GNOME for the first time. This promises to be interesting! I'll also talk about usability testing in general, and how developers can apply usability testing to their own programs. 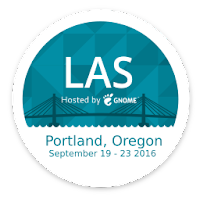 I hope to see you at LAS GNOME in September! Also, my friend Asheesh Laroia will be there, likely talking about Sandstorm, an open source self-hostable web app suite that welcomes new contributions. I first met Asheesh when I worked at the University of Minnesota Morris, and Asheesh visited us as part of "Open Source Comes to Campus" by OpenHatch. Hi Asheesh! It will be good to see you again. "I have conducted user experience tests with 4 people so far, and have two more tests appointed for Tuesday. After the tests I'll be able to write about my first impressions and start working on the analysis!" It will be interesting to focus first on the "activity" of the users. What tasks did they do during their "warm up" period? Did everyone do the scenario tasks you set them, or did they do something else? Did they have difficulty? Follow up with an analysis of the testers' "engagement." Generate a quick histogram of the emoji responses? You don't have to create a chart for this. You can use the emoji-with-counts method that The Washington Post used in their article. "I have one test left to do, I've had some cancellations/reschedules, and then I will start on my analysis." Even though this is a paper prototype test, I think the analysis method will be similar to a traditional usability test. See below. "I have completed the tests, it went great overall! I have already started with the analysis. I am planning to write a brief item on my blog with my first impressions on Tuesday and then post the analysis on Saturday or Sunday." For this analysis, I find it's best to do the analysis in two parts: a heat map, and a discussion of themes. To create your heat map, use the method I describe on how to create a heat map. Starting with the heat map, themes may become obvious. Look for "hot" rows (lots of black, red or orange). 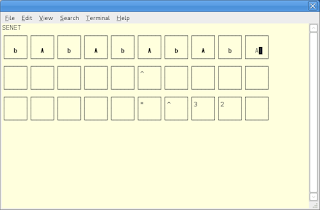 "Cool" rows with lots of green or yellow are likely to be areas with good usability. Pull quotes from users during the tests to give examples of problems in "hot" rows. What was common between these "hot" rows? 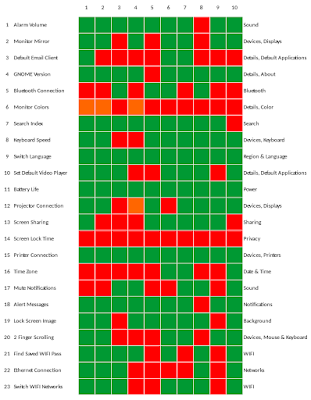 Were users confused by the same or similar design patterns in these difficult areas? Also look at what went well: What was common between the "cool" rows? Why did users find these easy to do? I recently discovered this on YouTube from a few years ago (2013) and had to share. I'm posting this not because it's Super Mario Bros, and not because it's stop-motion animation. It's because it was done in OpenOffice. An abuse of a spreadsheet, to be sure, but pretty impressive effort with some cool results. 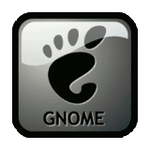 This week is the annual GNOME Users And Developers European Conference ("GUADEC"). I'm sad that I am not able to attend this year. I was looking forward to being there. As I've reported before, I have a few work conflicts this year. I started a new job in late December, as CIO in county government. The new position comes with new responsibilities and a new schedule. I have a County Board presentation when GUADEC is starting, to discuss our mid-biennium budget status for my department. This is our big opportunity to share with the County Commissioners our progress and our performance measures, and to request any budget adjustment. I can't miss this meeting. On top of that, we also have a network upgrade scheduled during the GUADEC core days. And immediately following GUADEC, I have family visiting us for a vacation. Even though I can't be there with you, I wish everyone the best! Until next year! 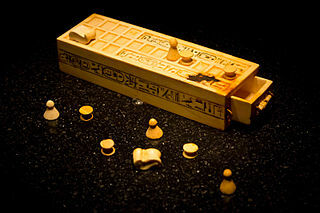 Years ago, I discovered the board game Senet, possibly the oldest board game we know of, dating back to ancient Egypt. It's a simple game, something like the modern board game Sorry if you combined it with another board game, Chutes and Ladders. After square 26, if you land on square 27, your piece "dies" and is "resurrected" at square 15. If you land on square 28, you need to throw an exact "3" to move that piece off the board. If you land on square 29, you need to throw an exact "2" to move that piece off the board. Most boards have special markings on these squares. You can't have more than one piece on any square. And instead of a standard 6-sided die, you make your "throws" by tossing four flat sticks, black on one side and white on the other. Basically, you toss four coins, heads or tails. The "throw" is the number of white sides shown (or number of heads, if you use coins). If no white sides (or heads) then the "throw" is a "6" and you get to go again. With only these simple rules, Senet is a fun game to play. But it's hard to find people to play Senet with. Several years ago, I had an idea to write a version of Senet that I could play against. Sure, there are a few free Senet games out there, but they either aren't open source software or they are written in a programming language I'm not familiar with. And because not everyone agrees on the rules, every implementation of Senet has its own rules. I wrote Simple Senet to implement a rule set that I preferred, with an eye to creating a modular rule set that you could configure to your own preferences. As an experiment to see which play style would perform better, I wrote my first version of Simple Senet as a simulator, where one side plays a defensive game, the other plays an aggressive game. Because it was an experiment, I wrote it with ncurses, so it ran at the console. I haven't touched this program in several years. I think it would be great for someone else to pick up this interesting project and implement it in GNOME. Use a module rules system so you can configure the game play in the Settings. And most importantly, make it turn-based with the option to play against a computer (either defensive or offensive). If you're interested in becoming the maintainer for this program, let me know. You can either send me an email or post a comment below.